Twenty-five years ago, Navjot Sidhu woke up – in a hotel room in Auckland – with a stiff neck. This is a critical detail in the history of Indian cricket. For Sidhu’s last four ODIs had yielded scores of: 34, 26, 79 and 108. His second-innings 98 had helped India save the only Test on that New Zealand tour. To this add a fruitful home series against Sri Lanka, and you had a batsman who had bedded himself at the top of the line-up. Had Sidhu woken up painless that morning, he would have opened the batting in Auckland. No question. And he is likely to have opened in the final two games of the series as well. Sidhuisms weren’t around then but one man’s neck-ache prompted another to put his neck on the line. That morning 21-year-old Sachin Tendulkar walked up to team manager Ajit Wadekar and captain Mohammad Azharuddin and “pleaded with them”, as he would later write in his book, to allow him to open the batting. Tendulkar had never opened for India but something told him that he could make the most of the field restrictions in the first 15 overs. He needed to use all his powers of persuasion. As of that March morning in 1994, Tendulkar’s one-day record was rather modest. He was well into his stride as a Test cricketer – leaving his mark in venues as varied as Manchester, Perth, Sydney, Johannesburg and Madras – but his 69 ODIs had brought 1758 runs at 30.84. Batting at No. 4 or 5, he invariably walked in with the field spread out and was either required to stem a top-order wobble or to nudge his way through the middle overs. Only rarely did he find himself with the freedom to express himself. Like during his rollicking 81 against Zimbabwe in a World Cup game – when India decided to ask Kapil Dev to open. Or a near run-a-ball 82 in Jaipur in 1993 when Tendulkar took on the England bowlers with such ferocity that the Times of India reporter would write: “he reduced everybody around him to subservient roles”. While recounting Tendulkar’s manic 82 in Auckland, it’s worth remembering that there was no need for such an innings that day. There was no net run-rate to contend with. No points table to worry about. New Zealand had been restricted to 142 on an Eden Park pitch that was challenging for run-scoring. They had inched past 100 as late as the 45th over. Some lusty blows had propped them up but at the break, India remained firm favorites. It’s also worth noting that India wore white for most bilateral one-dayers back then, so it was still a novelty to see them in a different jersey each time they traveled to the southern hemisphere. 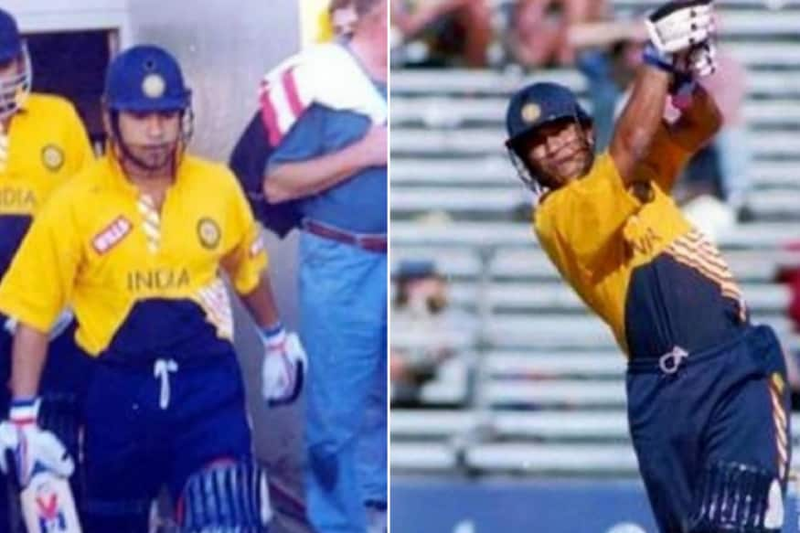 Tendulkar was invariably in a kit twice his size. Like on this day, when he was seen regularly scrunching up the sleeves of his yellow t-shirt, which wouldn’t stop inflating itself in the wind. Tendulkar took strike outside off stump. He waited for the bowler to deliver… and then moved across to cover he line of the ball. In the fourth over, from medium-pacer Chris Pringle, he caressed a classical off-drive, lofted another high to the ropes at vacant long-on and whipped a third off his pads to the boundary at midwicket. Each time the head was still, the balance impeccable, the timing expert and the follow-through classical. In the next over, bowled by Danny Morrison, he shuffled across the crease and glanced one past the fine-leg fielder for four. The fielder had to barely move a few feet. The ball struck the hoardings before he even tried. Gavin Larsen, one of the canniest one-day bowlers of the time, asked the wicketkeeper to stand up to his medium-pacers. Tendulkar charged him anyway and kept lofting him over his head. Larsen had no choice but to change his length. And Tendulkar slammed them off the back foot. Now remember that many in India were waking up to this heady fusion. Think of young boys and girls starting a relaxed Sunday, middle-aged men and women sipping on their coffees… only to be gobsmacked by this otherworldly assault in a remote corner of the world. Tendulkar was straight-driving like Gavaskar one moment, cutting like Kapil the next. He was bisecting the gaps and charging down the track. He was all batsmen in one. And one batsman in all. He was still Tendulkar, of course. Except he was showing us tricks he had never had a chance to reveal before. Now he had time and space. And he was bending them to his will. To be so far away, and to rely on television imagery, is to miss out on much of the magic. It is to fail to hear the sound the bat makes on the ball on impact. It is to fail to experience the hairs standing up on end when Tendulkar was breaking new ground. The late sportswriter Don Cameron was fortunate to be at Eden Park that day and it is clear from his words that he witnessed something transcendental. About 18,000 spectators were on their feet, applauding Tendulkar off the ground – when he popped a tame catch to the left-arm spinner Mathew Hart. The commentators had no doubt that he had played one of the greatest innings in any format of the game. The 82 may have come in a one-sided match in a bilateral series where there was little at stake. But it would go on to define an age. Tendulkar would open in 340 ODI innings and amass 15,310 runs. Other teams would ask their best batsmen to move to the top of the order. They wouldn’t need to rely on pinch-hitters for cameos; rather they would ask their superstars to bat through the innings. For the next few years, every Tendulkar innings would be imbued with a sense of possibility. He would get more innovative over time and take on attacks more threatening in tournaments more important. He would chase down targets more formidable. On pitches more challenging. Still in each of those performances, people knew vaguely what to expect. When the slate was clean. And the story was unknown. And anything – and everything – was possible.